The aims of this study were to present a remedy for isolated Weber type B fractures using a new surgical technique, a specialized anatomical locking plate without inter-fragmentary lag screws, and an early weight-bearing protocol after surgery, as well as to evaluate the outcomes of this remedy. The study included 29 patients (17 males and 12 females; mean age, 40.8 years, range, 18 to 82 years) with a minimum 1-year follow-up period. Surgery was performed as fixation without inter-fragmentary lag screws using a specialized locking plate that was pre-anatomically contoured on the outline of the fibula. Tolerable weight bearing was permitted in the second postoperative week. Fractures were compared clinically and radiologically to the injured side and were rated according to the criteria reported by McLennan and Ungersma. The Foot and Ankle Outcome Score (FAOS) were used to evaluate functional results. In all patients, union was achieved without any loss of reduction or malunion. There were no infections or wound complications. According to the McLennan and Ungersma criteria, all patients were rated good radiologically; however, 2 were rated fair and 27 were good functionally. The mean FAOS score was 90.5 (range 62.4 to 100) at 1 year follow up after surgery. The fixation method without interfragmentary lag screws using a specialized anatomical locking plate and early postoperative weight bearing has the advantages of being an easy procedure with greater stability and provides good functional and radiological outcomes in patients with isolated Weber B ankle fractures. Weber B ankle fractures are oblique fractures of the distal fibula with a fracture line beginning at the level of the tibial plafond. These are common, accounting for 60% of all ankle fractures . These fractures are rotational injuries caused by a supination-external rotation (SER) mechanism according to the Lauge-Hansen classification . The generally accepted treatment of displaced or unstable Weber B ankle fractures involves surgical stabilization, because anatomical restoration of the lateral malleolus is important to avoid subluxation of the ankle joint and promote biomechanical recovery [3,4]. Nevertheless, controversy remains with regard to the optimal method of fixation. Traditionally, fixation of the distal fibula with a one-third tubular plate and lag screws to achieve interfragmentary compression has been most frequently used [5,6]. However, some studies have demonstrated the disadvantages of this fixation method, including inferior biomechanical strength, loss of fixation, and inadequate distal fixation [6,7]. In recent years, alternative methods of fixation have been proposed including use of a posterior antiglide plate, locking plate, and various types of intramedullary devices. The locking plate has greater stability than other standard plates and the advantage of promoting early rehabilitation . Although based on a goal of relative stability, a literature review indicates that the locking plate for fixation of the distal fibula has in fact mostly been used with interfragmentary lag screws with a goal of absolute stability, using lag screws and conventional compression plates. We hypothesized that a new surgical technique using a specialized anatomical locking plate without interfragmentary lag screws would provide the advantage of allowing early weight bearing after fixation of distal fibular fractures. The aims of this study were to present a novel remedy for isolated Weber type B fractures, a new surgical technique using a specialized anatomical locking plate without interfragmentary lag screws, and an early weight-bearing protocol after surgery, as well as to evaluate the outcomes at 1 year after surgery. Twenty-nine patients with isolated Weber B ankle fractures who underwent fixation without inter-fragmentary lag screws using a specialized locking plate that was pre-anatomically contoured on the outline of the fibula by a single surgeon between 2015 and 2016 were enrolled in the present study. Surgery was performed on patients with a >2 mm displacement at the fracture site and a talar shift (Figure 1), using the anatomical locking fibular plate. The plate was chosen for the best fitting contour among 3 types of specialized locking fibular plates that were pre-anatomically contoured on the outline of the fibula (Jeil Med, Seoul, Korea; SIP, Seoul, Korea; Taeyeon Med, Seoul, Korea). All patients were followed up for at least 12 months to assess the functional and clinical outcomes using the Korean version of the Foot and Ankle Outcome Score (FAOS),  the degree of bony union, and any complications during the 12 months after surgery. 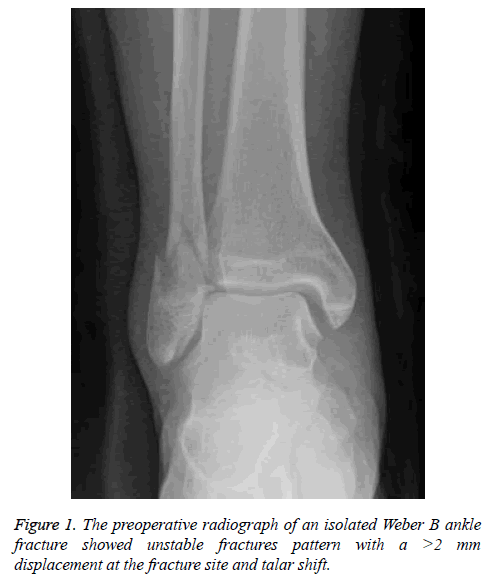 Figure 1: The preoperative radiograph of an isolated Weber B ankle fracture showed unstable fractures pattern with a >2 mm displacement at the fracture site and talar shift. The FAOS score contains 42 questions divided into 5 subscales: Pain, Symptoms, Activities of Daily Living (ADLs), Sports and Recreational activities, and foot- and ankle-related quality of life (QoL). Patients are asked questions about the symptomatic foot or ankle, such as: “Can you bend your foot or ankle fully?”, thus eliminating observer bias. Patients respond to each question on a scale from 0 to 4, and a total score between 0 (extreme symptoms) and 100 (no symptom) for each subscale is calculated according to a specific formula [9,10]. The functional and radiographic ratings at 1 year were also assessed according to the criteria reported by McLennan and Ungersma (Tables 1 and 2) . The time to return to sports activity and tourniquet time also were examined. Return to sports activity was considered when the patient could run, jump, or hike on an uneven terrain but could not participate in competitive sports. For better objectivity in the follow-up, all evaluations were performed by a single medical doctor other than the surgeon in order to minimize observer bias. Table 1. Functional rating according to McLennan and Ungersma’s criteria (compared to the normal ankle). Table 2. Radiographic criteria according to McLennan and Ungersma’s criteria (compared to the normal ankle). All procedures were performed with the patient in a lateral recumbent position with a pillow under the ipsilateral buttock. Under regional or general anesthesia, all procedures were performed using a tourniquet (300 mmHg). A longitudinal skin incision over the fracture line was made and soft tissue dissection was minimal, allowing exposure of only the fracture ends in order to reduce them anatomically and to fix them provisionally using a reduction clamp (Figure 2A). Two Kirschner wires were passed percutaneously from the posterodistal fragment to the anteroproximal fragment and perpendicular to the fracture line (Figure 2B). While maintaining reduction using 2 Kirschner wires, a specialized locking plate with the best fitting contour on an outline of the fibula was placed on the external side, adjusting it to the shape and length of the fibula (Figure 2C). A locking screw was fixed at the distal part of the fracture, followed by a second screw at the proximal part after reconfirming its intended location and adjustment to the fibular shape to maintain reduction. After removal of the Kirschner wires used to maintain the reduction temporarily, the 4 remaining locking screws were fixed at the distal and proximal regions between the first 2 screws (Figure 3). Ankle joint congruency and fracture reduction and stability were confirmed using C-arm imaging. Following routine closure of the wound, the neutral position of the ankle joint was fixed using a short-leg splint. Figure 2: (A) The fracture is reduced anatomically and to fix them provisionally using a reduction clamp. (B) Two Kirschner wires were inserted percutaneously, directly from the posterodistal to anteroproximal and strictly perpendicular to the fracture line. (C) During maintaining the reduction by two Kirschner wires, a specialized pre-anatomically contoured locking plate was placed on the external side of fibula, adjusting it to the shape and length of the fibula. Figure 3: Final follow-up anteroposterior radiograph showing complete bony union by the three type of specialized locking fibula plate. (A) Arix locking system (Jeil Med, Seoul, Korea), (B) SIPMEDSYS (SIP, Seoul, Korea), (C) TYM fibula locking plate (Taeyeon Med, Seoul, Korea). Non-weight-bearing active range of motion (ROM) exercise was started immediately and walking with crutches without weight bearing was allowed for 2 weeks with a short leg splint. After 2 weeks, the patients were allowed to walk with tolerable weight bearing but without a splint or walking brace. At 4 weeks, the patients were gradually allowed to walk with full weight bearing in normal shoes and could resume normal activities as tolerated. At 8 weeks, sports activities such as running were allowed. Normality of data was assessed by using Shapiro-Wilk test and parametric or non-parametric tests were used as appropriate. At 1-year follow-up period, the Foot and Ankle Outcome Score (FAOS) was analyzed using one-sample t test, as reference value by 80 (Fair). Statistical significance was set at p ≤ 0.01. All analyses were performed using SPSS v.24.0 (SPSS Inc., Chicago, Illinois). The mean patient age was 40.8 (range 18 to 82) years. Of the 29 patients, 17 were males and 12 were females. The mean follow-up period was 12.2 months (range 12 to 14) (Table 3). All fibular fractures healed clinically and radiographically by 8 weeks postoperatively. In all 29 patients, complete bony union was achieved without any loss of reduction or malunion during a minimum 1-year follow-up period. No patient developed any serious complications, including screw loosening, malunion, nonunion, delayed union, deep infection, loss of fixation, skin irritation, or peroneal tendon irritation. During a minimum 1 year follow-up period, the mean FAOS score was 90.5 (range 62.4 to 100), with a mean of 93.2 for Pain (range, 63.9 to 100), 92.4 for symptoms (range, 57.1 to 100), 95.5 for ADLs (range, 72.1 to 100), 85.0 for sports and recreational activities (range, 50 to 100), and 86.4 for foot- and ankle-related quality of life (QoL) (range, 18.8 to 100). The mean FAOS score (P<0.01) was considered statistically significant. According to the McLennan and Ungersma criteria, all patients were rated good radiologically; however, 2 were rated fair and 27 were good functionally. Mean time to return to sports activity was approximately 3 months and mean tourniquet time was 29.1 min (range 24 to 40). Table 3. Summary of baseline patient data. Fractures of the fibula are common injuries treated by orthopedic surgeons. The typical Weber B ankle fracture is caused by an SER mechanism according to the Lauge-Hansen classification . The SER pattern of ankle fracture comprises up to 85% of all ankle fractures . The surgical priority in the management of unstable ankle fractures is to reestablish joint congruency and restore the anatomical ankle mortise. Correction of fibular length and rotation is the main goal of anatomic joint restoration [3,4]. A lateral talar shift of just 1 mm can result in a 40% to 42% reduction in the tibiotalar area of contact [13,14]. Failure to address restoration of the anatomical ankle mortise has been reported to correlate with poor outcome and to induce the development of post-traumatic arthritis [15,16]. Surgical stabilization of displaced or unstable Weber B ankle fractures has been adopted to prevent traumatic arthritis and promote biomechanical recovery. Many methods are available for surgical fixation of the fibula, including the one-third tubular plate and screw, posterior antiglide plate, lag screw-only fixation, cerclage wire, hook plate, rush rod, biodegradable plate, intramedullary fixation and posterior plates, and locking-plate constructs. Various studies have reported on the different types of fixation methods and comparisons of these different fixation methods have been attempted. Nevertheless, the optimal method of fixation for the fibula remains controversial. The basic principles of internal fixation using a conventional plate and screw are direct, anatomical reduction and stable internal fixation of the fracture. A one-third tubular plate and lag screw has traditionally been used to achieve interfragmentary compression for direct lateral fixation of the distal fibula [5,6]. This method provides sufficient biomechanical stability, and will not lead to peroneal tendon irritation. However, there has been debate regarding the disadvantages of this fixation, including the inferior biomechanical strength, loss of fixation, and inadequate distal fixation. Screw loosening is of concern with regard to the goal of absolute stability using lag screws and conventional compression plates, especially in osteoporotic bones. Various authors have reported unsatisfactory fixation and decreased fixation strength with unicortical cancellous screws distal to the fracture site, especially in osteoporotic or comminuted bone [17-19]. The use of bicortical screws can provide superior fixation compared to unicortical fixation with cancellous screws [5,6], but intra-articular screw placement remains a possibility [20,21]. The use of an interfragmentary lag screw has been employed for increased compression and stability in oblique fibular fractures. However, this is not a viable option for patients with comminuted fractures, osteoporosis, and limited compliance with weight bearing. Moreover, early mobilization may in fact cause a slight increase in fracture instability [22-24]. The recently developed distal fibular locking plate consists of a plate and screw system in which the screws are locked in the plate. This locking system minimizes the compressive forces exerted by the plate on the bone. Precise anatomical contouring of a plate is no longer necessary, because the plate does not need to be pressed onto the bone to achieve stability. Moreover, this plate prevents primary loss of the reduction caused by inexact contouring of a plate at the fracture site. 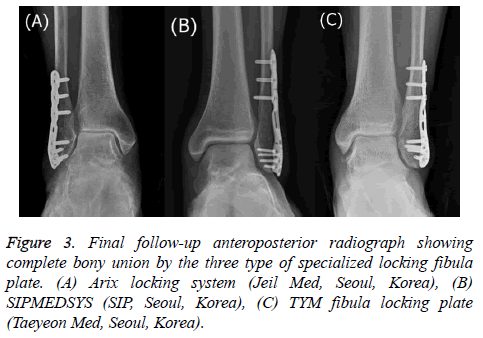 Intraoperatively, we chose the anatomical locking fibular plate with the best fit among 3 types of specialized locking fibular plates that were pre contoured to match the average anatomical form of the fibula in the Korean population. Consequently, the use of specialized locking fibular plates could decrease operative time and make surgery easier and simpler than with use of other fixation methods. The development of the locking plate method has been based on the concept of biological osteosynthesis. The basic locked internal fixation system aims at flexible elastic fixation to initiate spontaneous healing, as well as induction of callus formation [25,26]. In addition, the locking mechanism could diminish implant failure, such as screw toggle and backout, and avoid the consequences of immobilization, which may be exacerbated with the use of conventional plates in patients with deficient bone stock . Nevertheless, the distal fibular locking plate has mostly been used in conjunction with an interfragmentary lag screw in the same way as a method aimed at absolute stability, with use of lag screws and conventional compression plates. In the present study, only specialized anatomical locking plates were used for fixation of distal fibular fractures without interfragmentary lag screws. 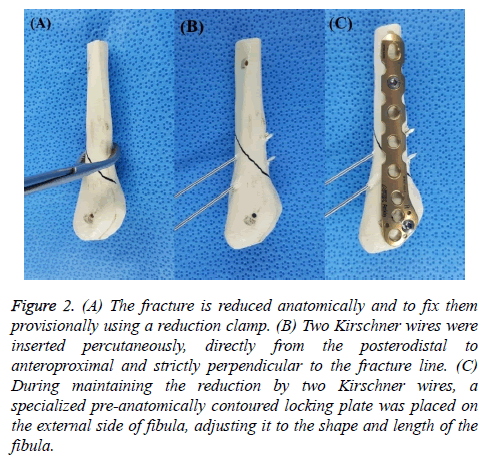 Percutaneous insertion of 2 Kirschner wires enabled maintenance of precise fracture reduction without use of interfragmentary lag screws until distal fibular locked plating. This study showed that a new surgical technique using a specialized anatomical locking plate without lag screws had a good radiologic outcome, without bony complications such as malunion, nonunion, delayed union, or loss of fixation. Accordingly, we suggest that anatomic locking plating alone without use of lag screws is an alternative for fixation of isolated Weber type B fractures based on the goal of stability for osteosynthesis. No consensus exists regarding the timing of weight bearing after surgical fixation of unstable traumatic ankle fractures. Immobilization or non-weight bearing can be associated with decreased ROM, ankle stiffness, and loss of muscle strength [28,29]. On the other hand, early motion is believed to be important for functional recovery in most fractures due to reduction of joint stiffness . Early weight bearing may accelerate recovery and improve overall function and quality of life [31,32]. In a multicenter randomized controlled trial, Dehghan et al. recommended early postoperative weightbearing and ROM exercise in patients with surgically treated ankle fractures, and reported a functional outcome with no increase in the complication rate. In addition, Tan et al. favored early weight-bearing postoperative protocols in unstable ankle fractures after open reduction and internal fixation, based on biomechanical analysis. Furthermore, locking plates have the advantage of promoting early rehabilitation with proper strength fixation. In the present study, all patients underwent early weight-bearing rehabilitation protocols, consisting of immediate ROM exercise and weight bearing at 2 weeks after surgery; 27 patients (93.1%) had functional recovery, with more than 80% of normal strength and ROM without pain or stiffness, and returned to a previous activity level. It is therefore believed that late weight-bearing rehabilitation should be avoided following surgical treatment for isolated Weber type B fractures, especially when a locking plate is used. Despite the advantage of locking plate osteosynthesis, which has regularly been associated with progressive callus formation [25,26], fixed angle devices have frequently led to asymmetric callus formation . To allow for more symmetric callus formation, additional dynamic fixation was introduced by some authors [36,37]. Horn et al. reported significantly faster fracture healing when using lag screws in a locking plate at the distal tibia. However, we did not observe asymmetric callus formation or delayed fracture healing using our treatment remedy for Weber B ankle fractures. Thus, we believe that the necessity of additional lag screws for locked plating in Weber B ankle fractures remains controversial. In future, biomechanical cadaver studies and clinical comparative trials will be necessary to establish the influence of an additional lag screw at the distal fibula when used with a locking plate. This study has some limitations. Like most retrospective cohort studies, our investigation had a number of methodological weaknesses. For instance, this was a cohort study with a limited number of subjects and a short follow-up period. Moreover, we did not compare treatment outcomes with those in patients who underwent fixation using a specialized locking plate with interfragmentary lag screws and specialized anatomical locking. Therefore, additional studies with a longer follow-up period are required to support our treatment remedy. In conclusion, we permitted early postoperative weight bearing after use of a new surgical technique with a specialized anatomical locking plate without interfragmentary lag screws in 29 patients with isolated Weber B ankle fractures. All patients showed complete union without any loss of reduction or malunion. Most of the patients showed satisfactory functional results on short-term follow-up. Therefore, we believe that this novel remedy, consisting of surgery without interfragmentary lag screws, use of a specialized anatomical locking plate, and an early postoperative weight-bearing protocol is a valid alternative for treating isolated Weber B ankle fractures. This research was supported by Hallym University Research Fund, by Basic Science Research Program through the National Research Foundation of Korea (NRF) funded by the Ministry of Education (NRF-2017R1A2B4012944), and by a grant of the Korea Health Technology R&D Project through the Korea Health Industry Development Institute (KHIDI), funded by the Ministry of Health & Welfare, Republic of Korea (HI12C1265). Hammacher ER, Schütte PR, Bast TJ. Minimal osteosynthesis of lateral malleolar fractures. Neth J Surg 1986; 38: 87-89. Lauge-Hansen N. Fractures of the ankle. III. Genetic roentgenologic diagnosis of fractures of the ankle. Am J Roentgenol, Rad Ther, Nucl Med 1954; 71: 456-471. Hughes JL, Weber H, Willenegger H, Kuner EH. Evaluation of ankle fractures: non-operative and operative treatment. Clin Orthop Relat Res 1979: 111-119. Roberts RS. Surgical treatment of displaced ankle fractures. Clin Orthop Relat Res 1983; 164-170. Michelson JD. Ankle fractures resulting from rotational injuries. J Am Acad Orthop Surg 2003; 11: 403-412. Milner BF, Mercer D, Firoozbakhsh K, Larsen K, Decoster TA, Miller RA. Bicortical screw fixation of distal fibula fractures with a lateral plate: an anatomic and biomechanical study of a new technique. J Foot Ankle Surg 2007; 46: 341-347. Kim T, Ayturk UM, Haskell A, Miclau T, Puttlitz CM. Fixation of osteoporotic distal fibula fractures: A biomechanical comparison of locking versus conventional plates. J Foot Ankle Surg 2007; 46: 2-6. Lee KM, Chung CY, Kwon SS, Sung KH, Lee SY, Won SH, Lee DJ, Lee SC, Park MS. Transcultural adaptation and testing psychometric properties of the Korean version of the Foot and Ankle Outcome Score (FAOS). Clin Rheumatol 2013; 32: 1443-1450. Roos EM, Brandsson S, Karlsson J. Validation of the foot and ankle outcome score for ankle ligament reconstruction. Foot Ankle Int 2001; 22: 788-794. McLennan JG, Ungersma JA. A new approach to the treatment of ankle fractures. The Inyo nail. Clin Orthop Relat Res 1986; 125-136. Schultze HU. [The classification of malleolar fractures according to Lauge-Hansen]. Beitr Orthop Traumatol 1969; 16: 188-195. Lloyd J, Elsayed S, Hariharan K, Tanaka H. Revisiting the concept of talar shift in ankle fractures. Foot Ankle Int 2006; 27: 793-796. Ramsey PL, Hamilton W. Changes in tibiotalar area of contact caused by lateral talar shift. J Bone Joint Surg Am 1976; 58: 356-357. Rukavina A. The role of fibular length and the width of the ankle mortise in post-traumatic osteoarthrosis after malleolar fracture. Int Orthop 1998; 22: 357-360. Thordarson DB, Motamed S, Hedman T, Ebramzadeh E, Bakshian S. The effect of fibular malreduction on contact pressures in an ankle fracture malunion model. J Bone Joint Surg Am 1997; 79: 1809-1815. Koval KJ, Petraco DM, Kummer FJ, Bharam S. A new technique for complex fibula fracture fixation in the elderly: a clinical and biomechanical evaluation. J Orthop Trauma 1997; 11: 28-33. McKean J, Cuellar DO, Hak D, Mauffrey C. Osteoporotic ankle fractures: an approach to operative management. Orthopedics 2013; 36: 936-940. Schaffer JJ, Manoli A, 2nd. The antiglide plate for distal fibular fixation. A biomechanical comparison with fixation with a lateral plate. J Bone Joint Surg Am 1987; 69: 596-604. White NJ, Corr DT, Wagg JP, Lorincz C, Buckley RE. Locked plate fixation of the comminuted distal fibula: a biomechanical study. Can J Surg 2013; 56: 35-40. Wissing JC, van Laarhoven CJ, van der Werken C. The posterior antiglide plate for fixation of fractures of the lateral malleolus. Injury 1992; 23: 94-96. Ahl T, Dalén N, Lundberg A, Bylund C. Early mobilization of operated on ankle fractures. Prospective, controlled study of 40 bimalleolar cases. Acta Orthop Scand 1993; 64: 95-99. DiStasio AJ, Jaggears FR, DePasquale LV, Frassica FJ, Turen CH. Protected early motion versus cast immobilization in postoperative management of ankle fractures. Contemporary Orthopaedics 1994; 29: 273-277. Lehtonen H, Järvinen TL, Honkonen S, Nyman M, Vihtonen K. Use of a cast compared with a functional ankle brace after operative treatment of an ankle fracture. A prospective, randomized study. J Bone Joint Surg Am 2003; 85-85A: 205-211. Claes L. Biomechanical principles and mechanobiologic aspects of flexible and locked plating. J Orthop Trauma 2011; 251: S4-S7. Plecko M, Lagerpusch N, Pegel B, Andermatt D, Frigg R, Koch R. The influence of different osteosynthesis configurations with locking compression plates (LCP) on stability and fracture healing after an oblique 45 degrees angle osteotomy. Injury 2012; 43: 1041-1051. Zahn RK, Frey S, Jakubietz RG, Jakubietz MG, Doht S. A contoured locking plate for distal fibular fractures in osteoporotic bone: a biomechanical cadaver study. Injury 2012; 43: 718-725. Chesworth BM, Vandervoort AA. Comparison of passive stiffness variables and range of motion in uninvolved and involved ankle joints of patients following ankle fractures. Phys Ther 1995; 75: 253-261. Stevens JE, Walter GA, Okereke E, Scarborough MT, Esterhai JL. Muscle adaptations with immobilization and rehabilitation after ankle fracture. Med Sci Sports Exerc 2004; 36: 1695-1701. Nash CE, Mickan SM, Del Mar CB, Glasziou PP. Resting injured limbs delays recovery: a systematic review. J Fam Pract 2004; 53: 706-712. Gul A1, Batra S, Mehmood S, Gillham N. Immediate unprotected weight-bearing of operatively treated ankle fractures. Acta Orthop Belg 2007; 73: 360-365. Thomas G, Whalley H, Modi C. Early mobilization of operatively fixed ankle fractures: a systematic review. Foot Ankle Int 2009; 30: 666-674. Dehghan N, McKee MD, Jenkinson RJ, Schemitsch EH, Stas V, Nauth A, Hall JA, Stephen DJ, Kreder HJ. Early weightbearing and range of motion versus non-weightbearing and immobilization after open reduction and internal fixation of unstable ankle fractures: a randomized controlled trial. J Orthop Trauma 2016; 30: 345-352. Tan EW, Sirisreetreerux N, Paez AG, Parks BG, Schon LC, Hasenboehler EA. Early Weightbearing after Operatively Treated Ankle Fractures: A Biomechanical Analysis. Foot Ankle Int 2016; 37: 652-658. Lujan TJ, Henderson CE, Madey SM, Fitzpatrick DC, Marsh JL, Bottlang M. Locked plating of distal femur fractures leads to inconsistent and asymmetric callus formation. J Orthop Trauma 2010; 24: 156-162. Adams JD, Tanner SL, Jeray KJ. Far cortical locking screws in distal femur fractures. Orthopedics 2015; 38: e153-156. Gardner MJ, Nork SE, Huber P, Krieg JC. Stiffness modulation of locking plate constructs using near cortical slotted holes: a preliminary study. J Orthop Trauma 2009; 23: 281-287. Horn C, Döbele S, Vester H, Schäffler A, Lucke M, Stöckle U. Combination of interfragmentary screws and locking plates in distal meta-diaphyseal fractures of the tibia: a retrospective, single-centre pilot study. Injury 2011; 42: 1031-1037.